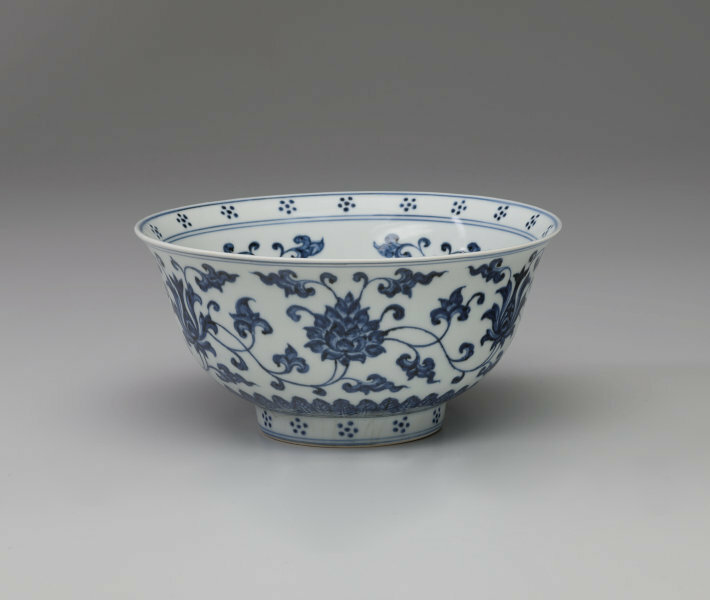 Exemplifying the mature refinement of the classic Ming aesthetic, this bowl from the imperial kilns at Jingdezhen embodies the ideals of serenity and harmony. 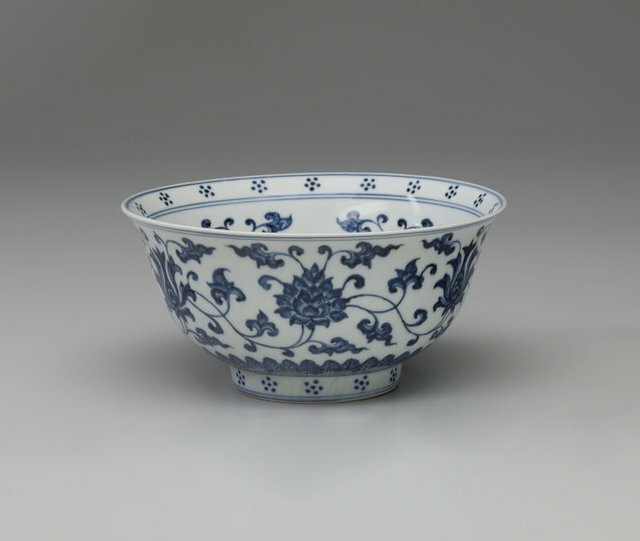 Although its eloquent form with a gently curled lip attests to the technical supremacy of the Ming potter, the real hallmark of the imperial Ming style is expressed in the harmony of form and decoration: the manner in which the lotus scrolls on the exterior - and the six lotus blooms around a peony spray on the inside of the bowl - flow seamlessly around the vessel. On the deeply recessed base the bowl carries the six-character mark of the Xuande reign drawn in underglaze blue. In spite of this mark, the undisputed quality of the bowl, and the characteristic bluish clear glaze with its 'orange skin' surface, a slightly later date of c. 1450-65 is suggested by a few anomalies: notably the specific design of the lotus scroll and the weight of the bowl relative to its size. Art Gallery Handbook, 1999. pg.253. Hepburn Myrtle, 'Chinese Porcelain of the Ming and Ch'ing Dynasties', Art Gallery of New South Wales, Sydney, 1977. p8.